Monitech, LLC. provides a fully integrated ignition interlock device program including manufacturing, installation, service and comprehensive monitoring and reporting. 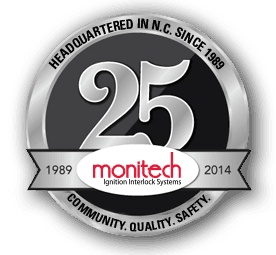 Founded in 1989, Monitech partnered with North Carolina to create the state’s original ignition interlock program. Today, Monitech serves customers from all 100 counties in North Carolina, and it does so through industry-leading technology, a statewide network of service centers and a team of full-time certified technicians located within 50 miles of any North Carolina citizen.